This winter we have seen prime conditions for ice dams – lots of percipitation and temperatures that swing from extemely low to warm. 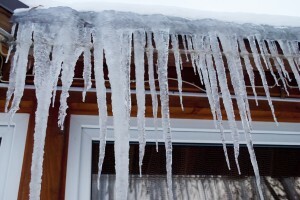 Hopefully your roof will escape the effects of ice damming, but just in case, here are some tips that can help prevent it. Make sure that your attic has proper ventilation. Approximately one square foot of ventilation opening is recommended for every 150 square feet of attic space. Check for air leaks in your attic from pipe vents, electrical junctions, etc. Seal any leaks. Be sure that your attic is well insulated. Insulation such as Owens Corning Atticat blown-in attic insulation provides a high R-value, helping to ensure that your home does not rapidly lose heat. If you are able, use a rake or broom to clear snow from your gutter, and approximately 3-4 feet above it.This will help allow water to properly drain into the gutter. Pay close attention to ceilings during snow/freeze/thaw period. If you see signs of a leak, contact a professional to check for damage. Mold can begin forming in as little as 72 hours, so taking care of leaks promptly is crucial. After all of the snow and ice thaw in the spring, it is wise to check your roof for any damage. Harsh winter conditions can cause shingles to loosen or fall, particularly on older homes. Be sure to have loose or missing shingles repaired or replaced right away to prevent future damage. As always, when you need assistance with your roof, contact the professionals at S&K Roofing, Siding and Windows. We have helped homeowners care for their home’s exteriors since 1980. We are licensed, bonded and insured, hold an A+ rating with the Better Business Bureau, and have received Angie’s List Super Service Award for 9 straight years. Contact us today at 1-866-836-ROOF.